Because you muddle the blackberries for this recipe, their juices are released and you can enjoy the infusion almost immediately. To muddle (aka smash), you use a muddler or even just a wooden spoon. 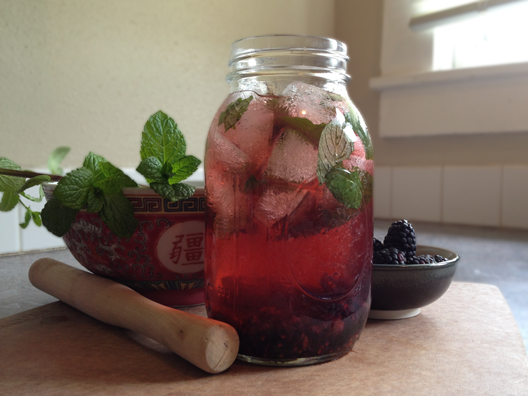 Recipe for a 32-ounce ball jar: 10 blackberries, muddled + 10 mint leaves, torn. Muddle those blackberries into a pulp, add your mint, then add water. Let the infused water sit for 5-10 minutes, then add ice and stir. It’s the perfect drink for a hot day! For the daring, you can also let the water infuse for four hours, then use it as a mixer for vodka drinks. It’s unbearably delicious. Also note how the mint is in a bowl in the background. Mint stays fresh in water, so if you pick a few stalks, you can put them in a bowl of cold water and the mint leaves will stay perky for up to three days. When you use mint in infused water recipes, tear each leaf in half to release its flavor. I love these recipes, I tried one for the first time yesterday and am making another one today! My question is can I use blueberries with the peppermint instead of blackberries? Hi! I just wanted to say thanks for the recipes! I recently bought a fruit infuser water bottle that is 32 oz and I am looking forward to trying these in it! I am 7 months pregnant and this will be a great way to make sure I am getting enough water without being so bored! 🙂 Plus, I will definitely try the mixer with vodka once I am no longer pregnant 😉 Hope you have a great day! Can frozen blackberries be used? I I picked a lot over the summer and then froze a bunch. I was just wondering if they can be used if it’ll work just as well? 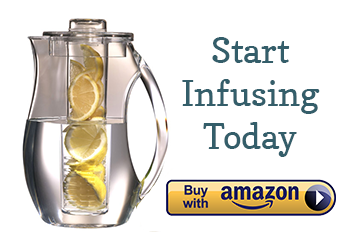 Why don’t you give alternatives for using a pitcher with an infuser. I tried to use a regular jar, but I didn’t eating pieces of mint. How do I make them better and tastier, but with an infuser. Do I leave them in longer, mash them to a pulp.